The Red-billed Pionus Parrot aka Sordid Parrot (Pionus sordidus sordidus) is endemic to Northern South America, specifically Venezuela in Lara and Falcón Provinces. Range: Santa Marta Mountains in northern Columbia. Range:Sierra de Perijá, mountain chain forming border between northwest Venezuela and northern Columbia. The Red-billed Parrot averages 11 inches (28 cm) in length. The plumage is generally olive-green. The head is also olive-green except the feathers to the crown and back of the head are broadly edged with dark-blue. The cheeks are olive with blue tips. There is a blue band across the throat and upper breast. The breast and abdomen are dull olive, each feather with duller edging tinged bluish-pink. The under tail-coverts are red. The back is dull olive-green, each feather with olive-brown markings. The middle tail-feathers are green and the outers are blue with red at the base. They have red bills with a paler base. Their eye rings are grey and their irises dark brown. They have grey feet. 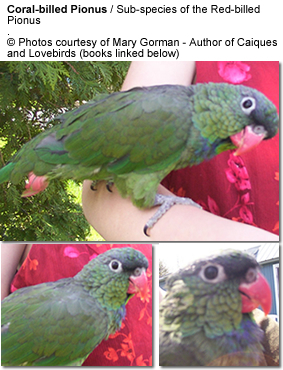 Young birds have a pale green head, and yellowish-green under tail-coverts with a few red feathers. For cage construction, breeders suggested the following dimensions: 4 feet wide by 4 feet tall by 6 to 8 feet long. Suspended cages facilitate sanitation as droppings and discarded food fall through the wire cage floor. Grandfather-style nest boxes work best. A size that works well is 10" wide x 10" deep x 18-24" high. Place the nest box high up in a dark, secluded area of the aviary. The hen typically lays 3 eggs, which she incubates for 26 days. The chicks usually fledge when they are 8 to 12 weeks old. Pionus chicks are challenging to handraise and it is best to allow the parents to take care of the chicks for at least the first week. Various green foods and mealworms are appreciated by the parents for feeding the chicks. Corn cob is a favorite weaning food. Description: They average 11 inches (28 cm) in length. 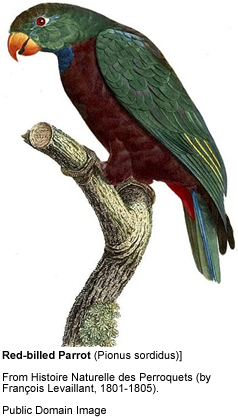 This parrot looks similar to the nominate form described and featured above, but is generally darker green; back feathers without olive-brown markings; breast and abdomen virtually uniformly green, without bluish-pink edging. Distribution: Santa Marta Mountains in northern Columbia. Description: Looks similar to the nominate form described and featured above, but with much paler plumage; breast without bluish-pink tinge; abdomen olive-yellow, all feathers with pale yellowish edging; smaller ... Length: 10 in (26 cm). Distribution: Sierra de Perijá, mountain chain forming border between northwest Venezuela and northern Columbia.